Have you ever had this happen? 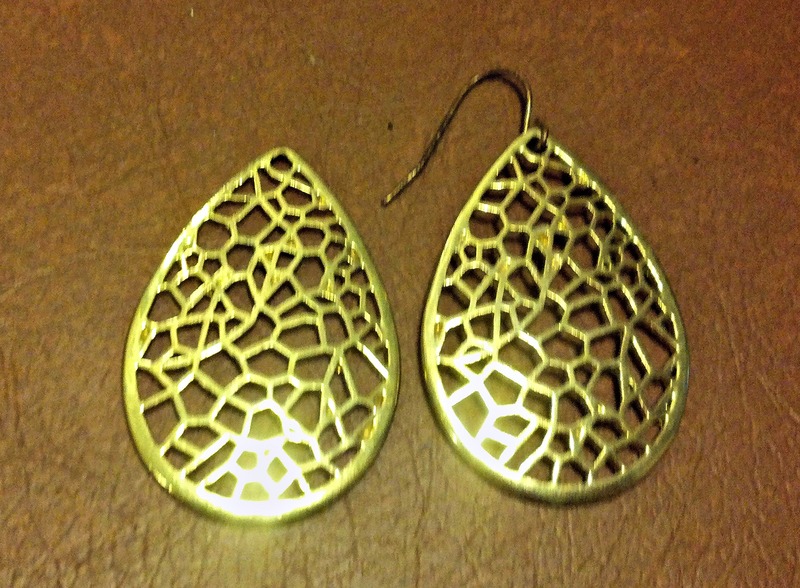 A favorite pair of earrings looses an ear wire and you have no clue what to do? Well, assuming that the earring itself is not broken, you CAN repair it! All you need to do is replace the ear wire. Now I recently received a call from a family member asking me about exactly this problem. She had no idea how do find replacement ear wires. Well, years ago I would have told you to locate a jewelry supply store, and obviously that is still an option. But with the major explosion of crafting stores you can easily locate a store that sells ear wires. Bead stores, JoAnn Fabrics, Michael’s, and Hobby Lobby are just a few of the places that will have ear wires for sale. If you are not sure where to look in the store just ask for the location of the jewelry supplies. Ear wires are usually sold in clear plastic packages on the hanging racks. 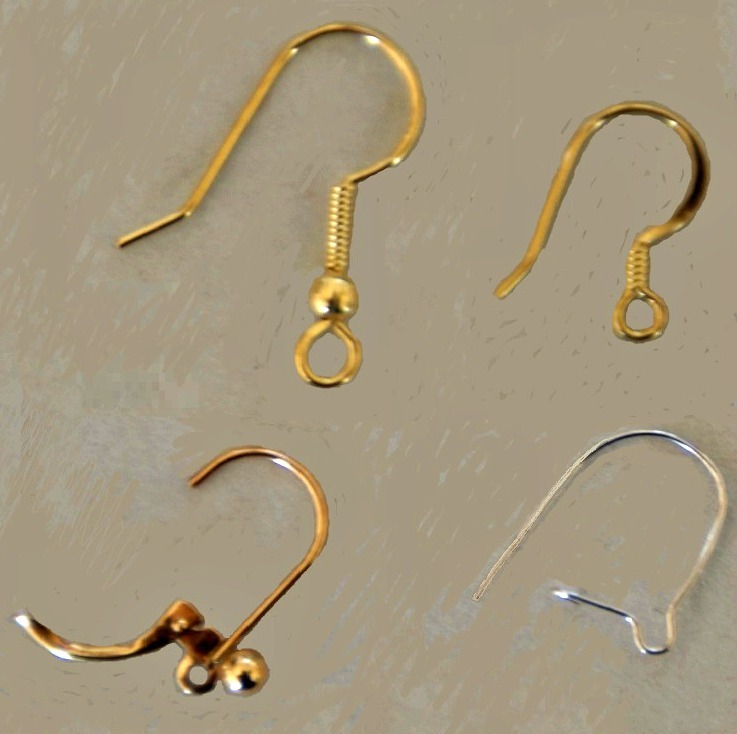 Ear wires come in different styles and metal colors. Be sure to choose new wires that match the old ones, unless you decide to change both of the wires. Here is a picture of just a few of the styles that are available. So now that we have earring wires, we need to put the new wire on the earring. If you have an ear wire that has a closed loop you need to look carefully at the loop and figure out where the loop opens. 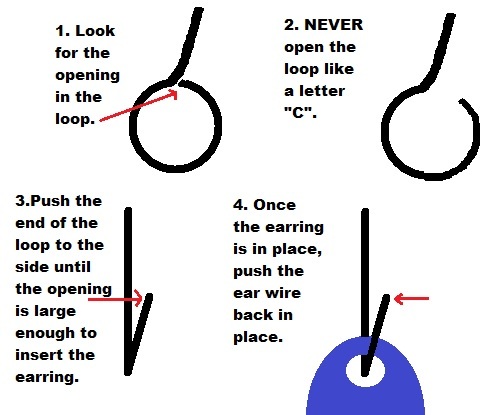 Now, the most important technique that you can learn is how to open the ear wire loop correctly. If you open the loop correctly it will be easy to close it back up again and have it look good. The process is simple. Never, and I repeat NEVER open to the loop to form a letter “C”. The loop must be opened by using a pair of chain nose or flat nose pliers to push it sideways. This picture demonstrates the process. All metal loops that are used in jewelry should be opened in this manner. It avoids stretching the metal loop out of shape and is much less likely to break the loop. If you do accidentally warp the shape of the loop it should be possible to carefully reshape the loop using a pair of round nose pliers. I hope that this simple technique helps you in your quest to do minor jewelry repairs.